The traditional Porto Perissa Hotel is 60 meters away from the long black beach of Perissa which is located under the ancient Thira of Santorini. 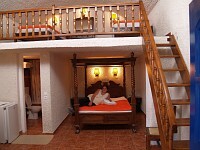 The accommodation at the Porto Perissa hotel is comprised of rooms with two, three or four beds. Traditionally furnished and with individual Bathroom. Room Facilities include Air- conditioning, Refrigerator, Telephone, Music, Radio, CD, TV, Hairdryer, Safety Box and Balcony or Veranda. 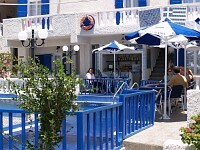 General services & facilities at the Porto Perissa hotel include a Swimming Pool, Children's Pool, Jacuzzi, Living Room with TV, Dining Room for Breakfast and a Cafe Bar serving drinks and cocktails.